According to Bloomberg, at least 100,000 individual miners have shut down because of Bitcoin price crash. Beijing Internet Finance Industry Association: Prevent the risk of illegal activities in the name of STO. Danhua Capital’s investment in the fields of finance and blockchain technology account for more than 70% of its total investment. The opinion collection meeting for several specifications including “Blockchain Privacy Protection Specification” was held in Beijing. Huobi gains Gibraltar DLT license and plans to launch global exchange in 2019. Venezuela President: All oil trade in Venezuela will be settled with the cryptocurrency “Pedro” next year. Open section in Tencent Cloud, specializing in sharing WaykiChain blockchain, database, smart contract and other technical topics. Huobi has gradually opened up to publish WaykiChain’s original articles. Submitted the upgrade requirements for WaykiTimes. Followed up on T2D2 program. Entered”Global Village of Blockchain” forum. Applied for WaykiChain’s project display in Feixiaohao new version. Held WaykiChain mascot naming contest on Twitter, activity period Dec 5 — Dec 16. 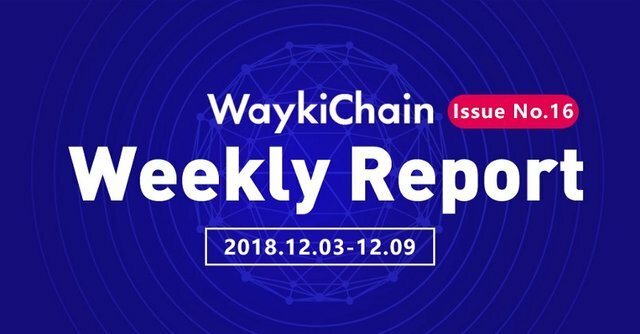 Published “Waykichain Project Rundown” on Altcoin Magazine, the authoritative E-magazine in cryptocurrency and blockchain industry. WaykiChain team attended Chain Plus+ Blockchain New Economic Forum in China, which was hosted by Chainers and co-organized by JRR Capital and J One Capital. The guests included Bittrex, Coinbase and other leading exchanges. ③ 50 completed blockchain game development. ② Started to operate WaykiChain developer community, which has 113 members so far. ① Continued to fix some problems of code description. ② Continued to launch WaykiTimes on application stores — newly on Meizu App Store; Currently WaykiTimes has been available on 7 app stores. ③ Completed phase two product planning and conducted an internal review. ③ Conducted the numerical model for @ version, as well as the value table configuration of demo version.